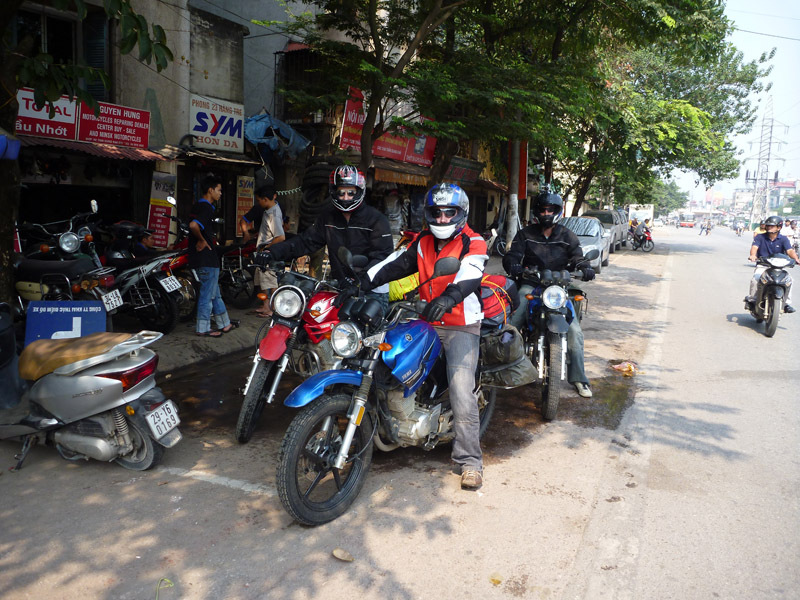 Well the first morning of the riding started with a quick trip to a book shop the other side of Hanoi. We’d dropped in to see Hung at Flamingo Travel late on Tuesday night just to check everything was set for the morning and he’d again suggested the use of a guide (US$50/day ++) and that we might struggle without one. This got us a little nervous and we went back to the hostel debating our options. 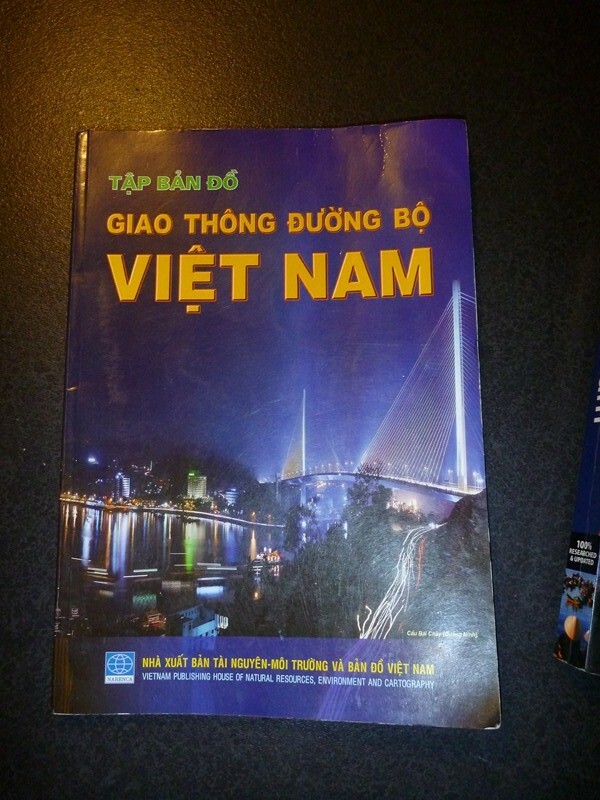 We got speaking to one of the guys on the tour desk about it and he said it was a waste of money and gave us a description of a map book that we should find that would get us to HCMC without issue. This would turn out to be the second best tip we would receive that night. Unfortunately he couldn’t tell us the name of the book, just that it was blue and had a picture of a bridge on the front. No worries we thought. How hard can it be? Well at 8am the next morning standing in front of the 3 story book store it suddenly seemed a more daunting task. Thankfully it only too about 15minutes and a trip all the way to the top floor before we found it. At a cost of only some $8 this book would ultimately become our bible. Page after page of detailed road maps including distances between each turnoff would become an invaluable tool given the lack of signage that is prevalent throughout Vietnam. To avoid having to stop at every turnoff or fork in the road we would sit down every morning and write-up a turn sheet. Eg…22km then turn right, 98km then turn left, etc. This was the only way to accurately navigate the maze of roads and thankfully the figures in the book proved to be spot on to the nearest kilometre. 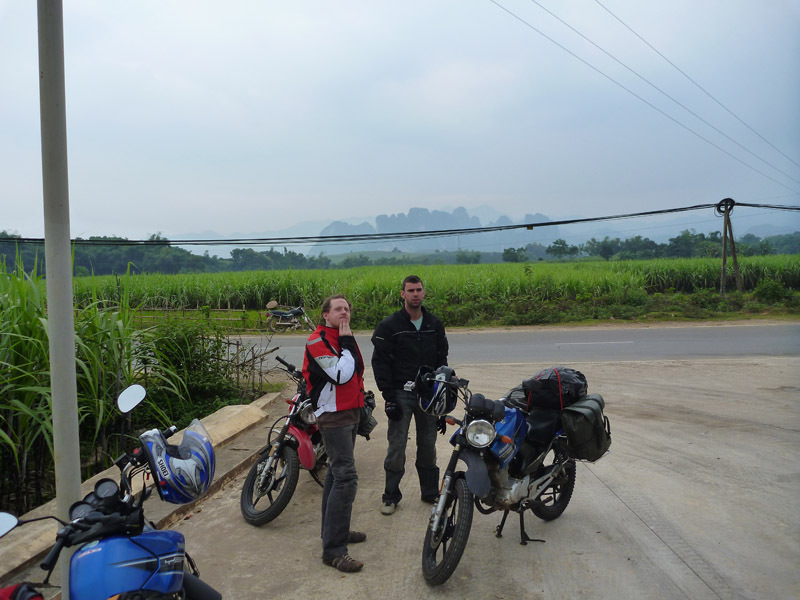 The best tip we would receive the night before departing was to completely change the route we were going to take down to HCMC. We got talking to an english couple in the dorm room who were heading off on a similar trip the same day. They were taking a little more time (2 months) and had bought their own bikes. 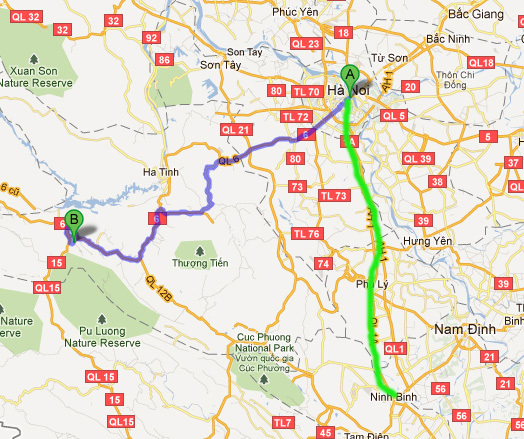 They had been told to stay well away from Hwy1 and travel inland to the Ho Chi Minh Trail and go south from there. This road would essentially follow the Laos boarder most of the way down and was supposed to be relatively newer roads and far less traffic than Hwy1 that followed the coast. 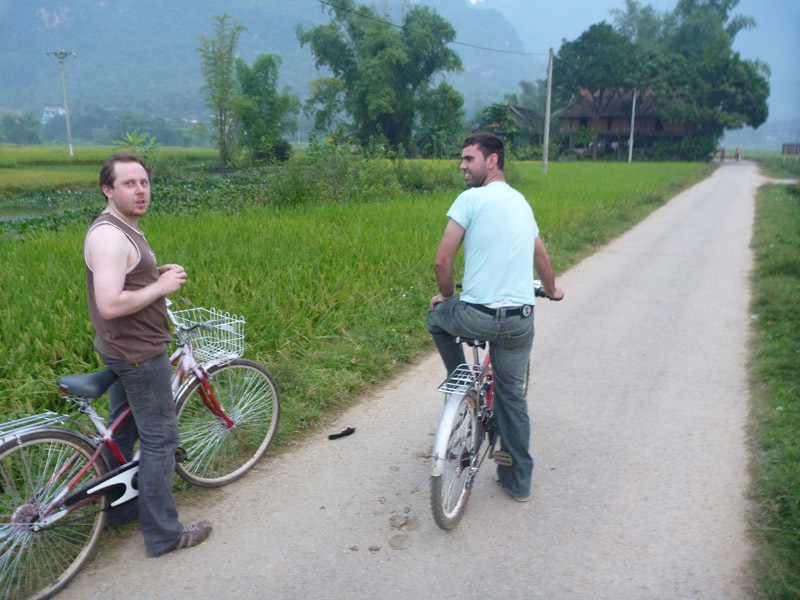 After a quick discussion we decided to give it a go and changed our plans to head to Mai Chau for the first night instead of Ninh Binh. 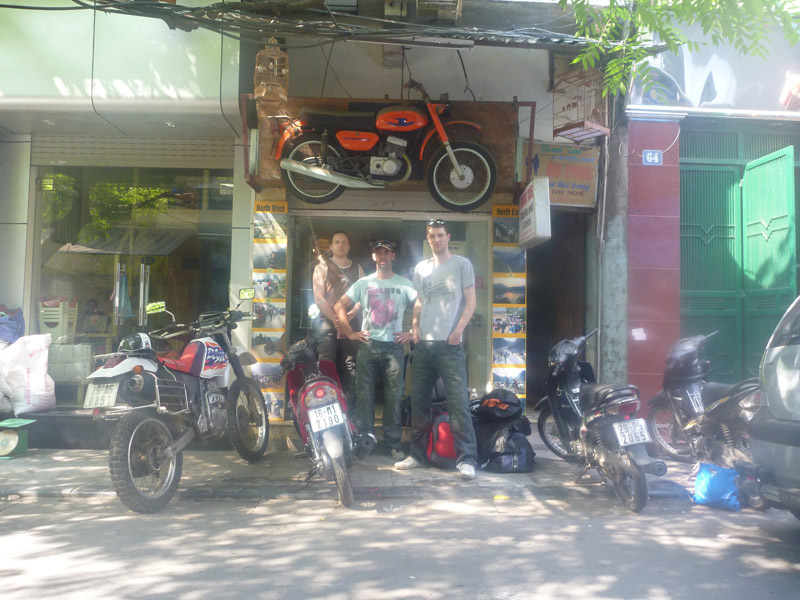 After picking up the map it was back to Flamingo’s head office to fill out the paperwork and get our bikes. 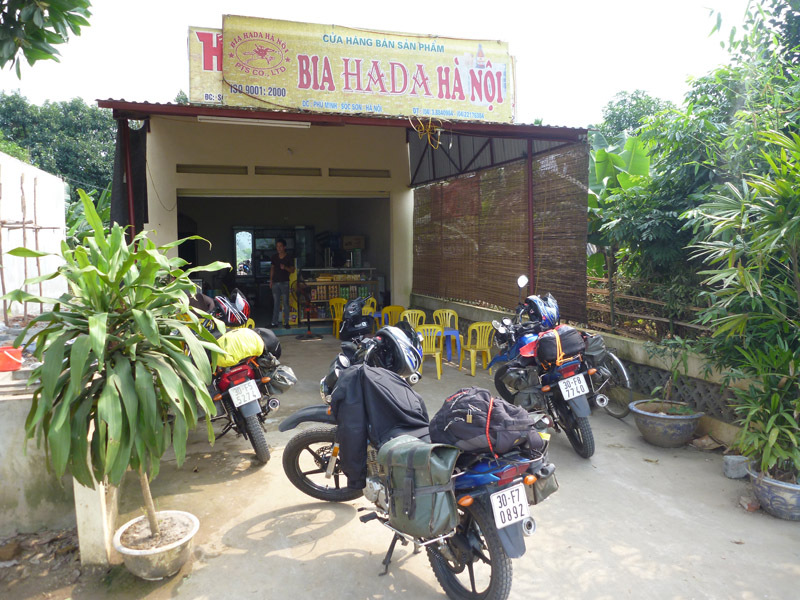 After putting down a US$500 deposit and surrendering our drivers licences (car not bike), and convincing Hung that we would be fine without a guide, we were in a cab over to their workshop to pick up the bikes. All three bikes were ready and waiting outside when we arrived. We got a brief run down of bike maintenance and the spare parts we would be provided with from one of the mechanics and we were soon loaded up and ready to go. 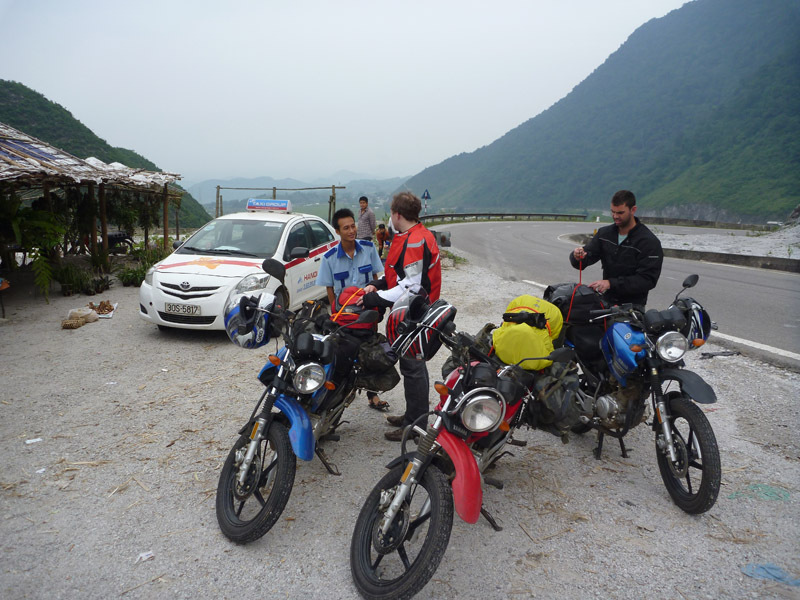 We negotiated with Hung a $30 fee for him to lead us about 14kms out of Hanoi to the start of Hwy 6 where we would be able to find our own way from. This was probably the best $30 we spent as we later learned it had taken the English couple nearly 3 hours just to navigate their way out of the city. We did encounter some early problems with the bikes and only made it to the petrol station before some stalling issues with my bike saw Hung suggest we return to the workshop to get a quick spark plug change. 10 minutes later (about midday) we were on the road again and heading out of Hanoi. Barely making it out of second gear for the first 20 odd kilometres out of Hanoi it was slow going but also great practice at low-speed for me. Yes, I actually signed up for a 2,200km journey through a country with some 20million motorbikes without any experience. Some suggested I may have had a death wish but hey, I’m still here to write this blog. 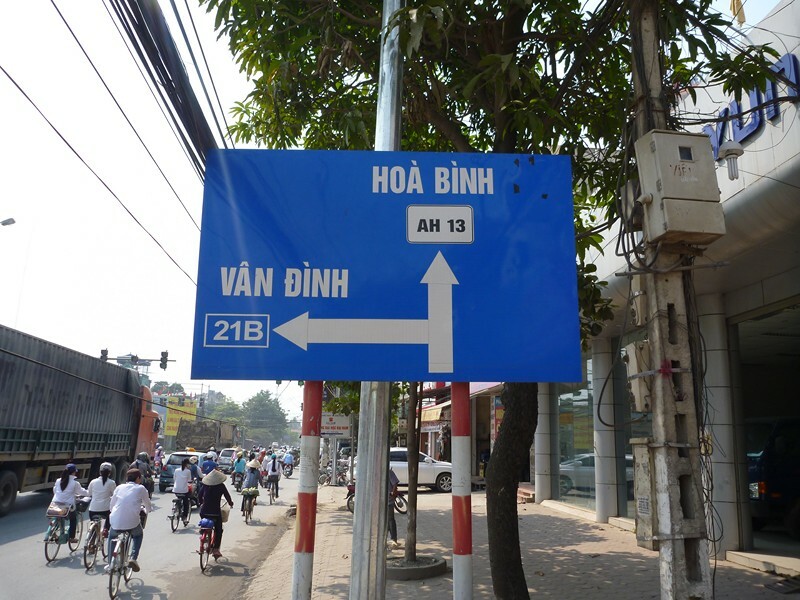 Ok back to the ride, once out of Hanoi we were instructed to follow the signs to Hoa Binh and Hung hesitantly left us with his bikes to continue on our journey. Signs we had to follow. Note the traffic to the left. A mix of container trucks and push bikes. What had we got ourselves into? 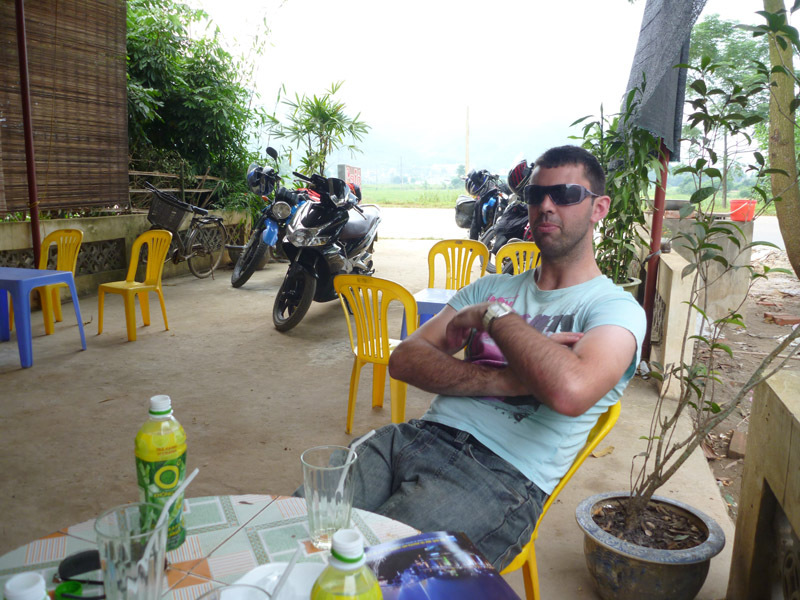 Once we cleared the Hanoi traffic and got about 50km out of the city, things started to ease up a bit. The traffic thinned out and we were able to test out the higher gears i’d heard these bikes actually had. I’d got the hang of the bike by now aswell and things we’re looking good. We hadn’t had a chance to eat as yet and it was now about 2pm so we decided to stop at the first place that looked like it had food. This would also be our first experience at trying to order something without speaking the language. We pulled into a nice place on the side of the highway that looked promising. Now anyone who’s spent any time in Vietnam will tell you that this place is a drinks (predominantly beer) “cafe” and isn’t going to serve meals. At the time however, we were completely oblivious and the staff found our attempts at gesturing that we were looking for food quite hilarious. Eventually something started to click and a young guy disappeared out the back and came back with a tin of corn. We thought we were getting somewhere so agreed only to have him disappear and return 10minutes later with the whole tin of corn deep-fried on a plate. Having given up on communicating we resigned to corn and small muffin type snacks for lunch on day one. Moving on somewhat unsatisfied with our attempt at lunch the view quickly took our mind of our empty stomachs. We had hit the mountains and what had been a daunting morning riding at 10km through bustling traffic turned into an afternoon of mountains and long flowing corners. 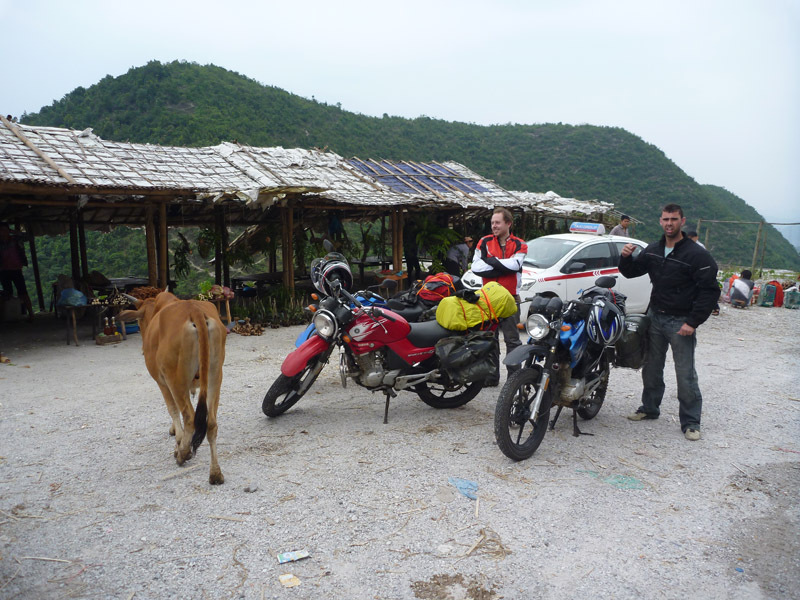 The roads were good and the worst we had to worry about was the odd cow or mountain goat taking a nap on the road. A quick stop to admire the view. There was a magnificant looking golf course through these peaks that I would love to come back and play some time. Shauno talking to the locals at the cliff side stalls. Crabs and corn on the top of a mountain. What choices we had. 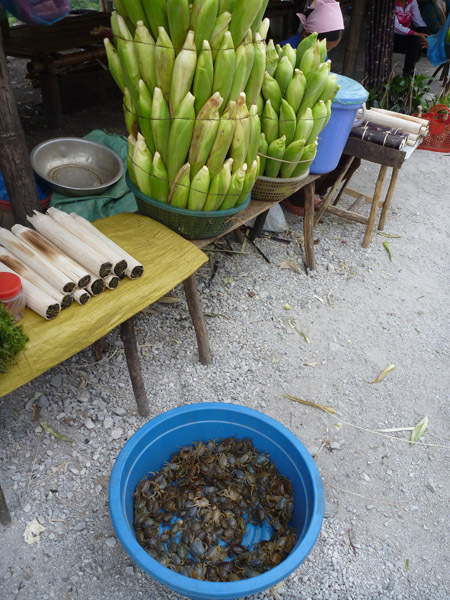 As the day continued and we approached the turnoff to Mai Chau I took us on somewhat of a detour. I’d read in the lonely planet (feverishly the night before after changing our whole itinerary) that there was a damn near the turnoff that was worth a look. After 10km of riding down a tiny dirt road we resigned to the fact that we definitely weren’t on the right road and decided to turn back. We did however get a great look at a tiny village where the locals seemed as amazed as we were at what we were seeing. 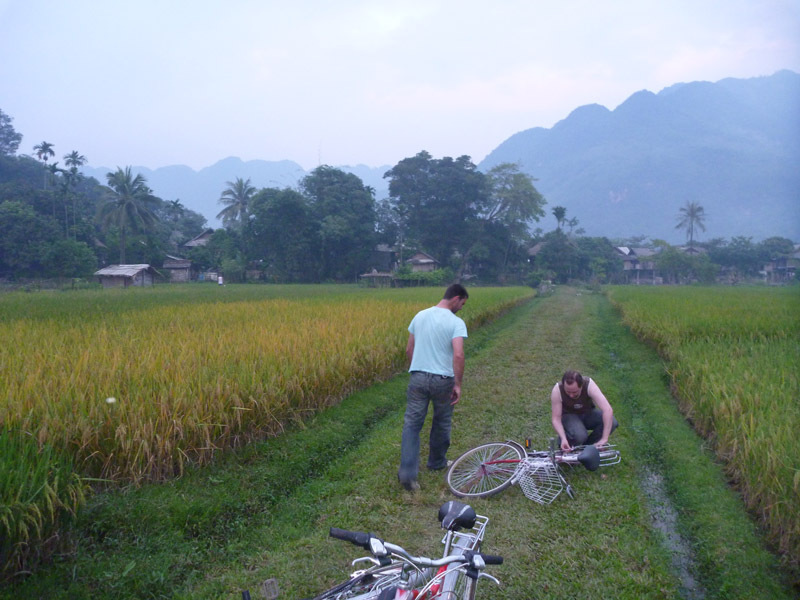 Eventually we made it back to the main highway and down the turnoff into Mai Chau. Now we’d been told that everyone here stays in the bamboo stilt villages but hadn’t been given any directions on how to find them (not even lonely planet was of assistance here). All I can tell any would be travellers is to keep a look out for the flashy lodge, head down the very small road beside it for about 2km and you’ll run into one of the two villages. After asking a couple of tourists where to go we rode up to the one that looked the nicest and decided it would be our stop for the night. 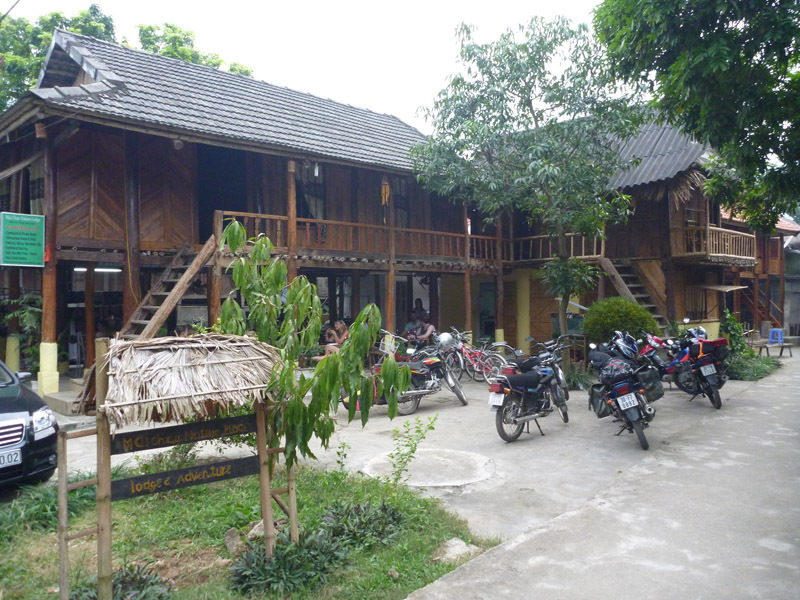 It was called Mai Chau Nature Place Lodge & Adventure (clearly something got lost in translation but we got the idea). The first thing we got was a warm welcome from the english couple who’d convinced us to change our route the night before. They were looking a little worse for wear having left 5 hours before us and getting in only 10minutes before we did (did I mention how worth it that $30 guide out of the city was). They’d also had one of their riding team come off in traffic and badly sprain a wrist so were busy tending to that. The accommodation here was very basic but you get the “local” experience and the staff and food were lovely. They quickly offered us a chair and a cold beer (we must have looked like we needed it). We were offered free use of their push bikes to have a look around and told that dinner would be in an hour. A hard earned cold beer after a long first day of riding. The town itself is know for its woven goods. If you’re after a woven scarf, bag or piece of clothing this is definitely the place to get it. 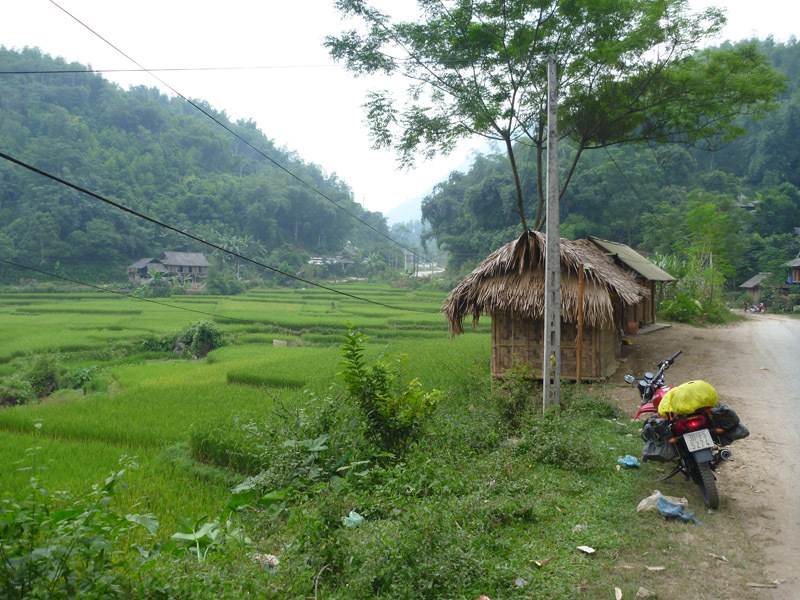 It’s also surrounded by rice fields that were great to have a quick ride around. Typical Shauno. 2 minutes on the thing and he’s thrown a chain. Hopefully not a sign of things to come. 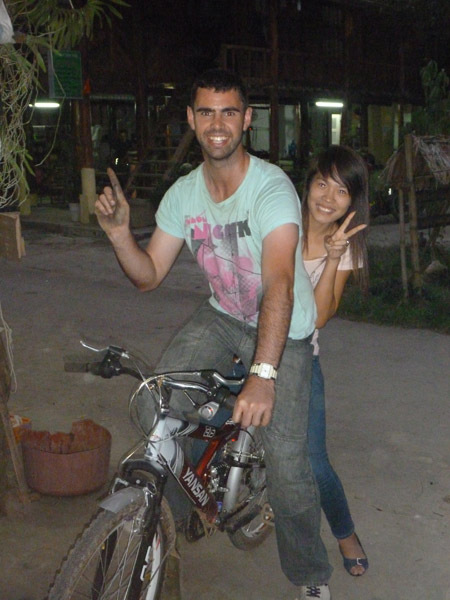 Jarrod picked up a new girlfriend on his travels. After repairing Shaun’s bike we made our way back to the lodge. Unfortunately Jarrod’s good looks were too much for one of the locals and he picked up a passenger on the way back. Once we finally convinced her he already had a girlfriend we made it back to the lodge and settled in to a few more beers and an amazing meal of about 6 local dishes to share between us and the English couple. We didn’t last long after dinner as we were all exhausted so we retreated to the bamboo floored room and settled in for the night. Very simple accomodation at Mai Chau lodge. 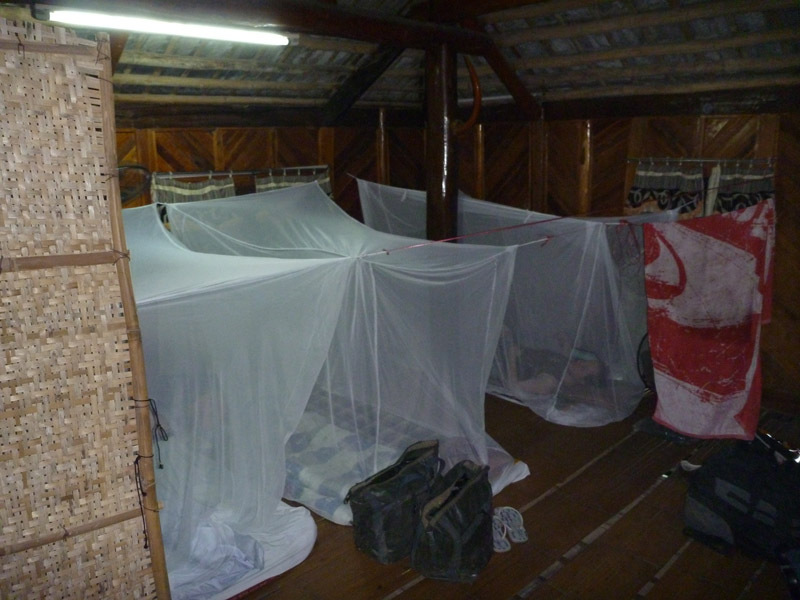 A very thin mat to sleep on and a fly net to keep the bugs away. So glad I found your guys’ blog! 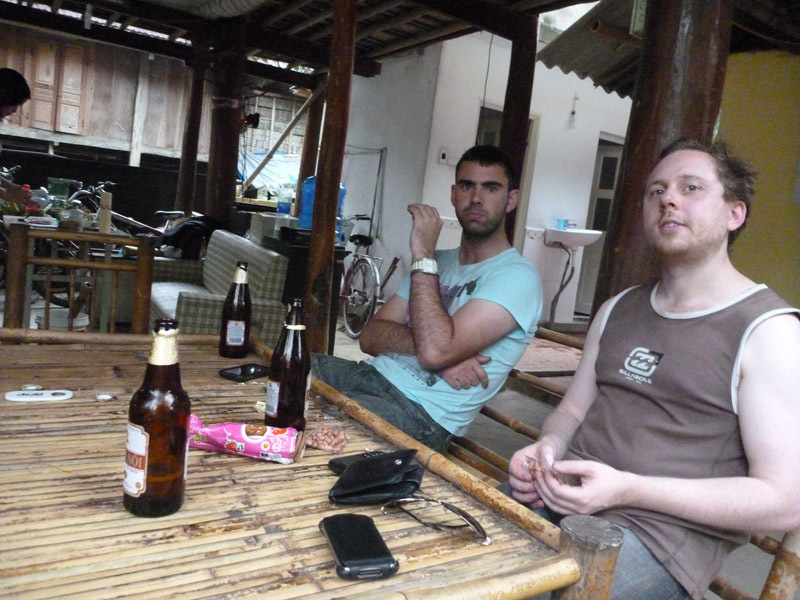 After watching Long Way Round a motorcycle trip has been on my list of things to do in a rad, foreign country. Looking forward to reading about the rest of the trip! good idea to have a trip like this!